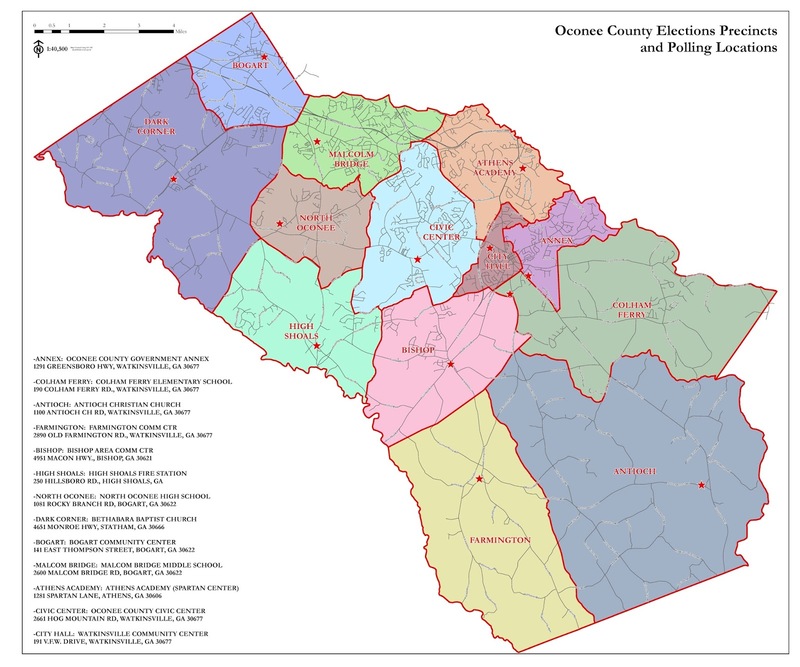 A total of 3,845 voters cast a ballot, representing 15.6 percent of the county’s 24,657 registered voters. In other county action tonight, the Board of Commissioners postponed a decision on a requested rezone in the western part of the county for a solar farm. The Board also approved a change in the county’s alcohol ordinances to allow for Sunday sale of beer and wine in groceries and convenience stores and beer, wine and alcoholic drinks in restaurants. The ordinance goes into effect immediately. Wiedower ran strongest in the southern, rural parts of the county and in Dark Corner, a large precinct in the western part of the county. 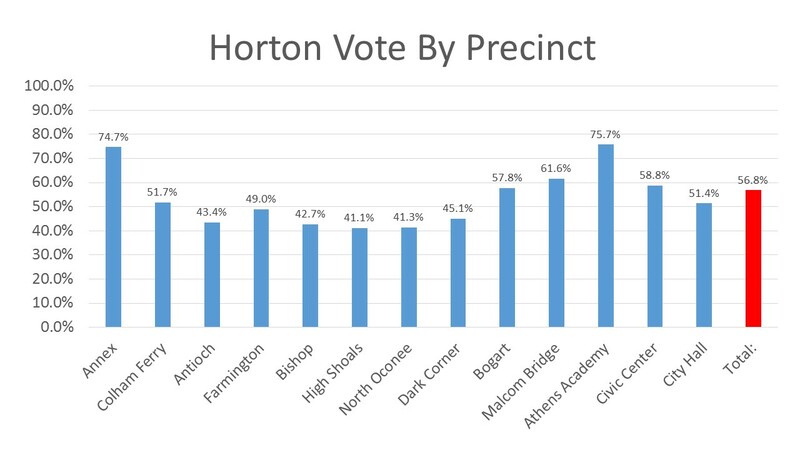 Horton got his largest vote total in Athens Academy followed closely by Annex. He got three-quarters of the vote in both of those precincts. Athens Academy includes the area along Daniells Bridge Road that would be affected by a proposed flyover of that road across SR Loop 10 to reach the Oconee Connector at Home Depot. Annex includes the residential area along Calls Creek. Horton took a strong stand against the Daniells Bridge Road flyover and against a proposed sewer pipeline down calls Creek. Wiedower’s stance on both issues was more nuanced. Turnout in Athens Academy was high, with 19.2 percent of the registered voters casting a ballot. Turnout also was high in Annex, at 18.2 percent. I live in a subdivision along Daniells Bridge Road. 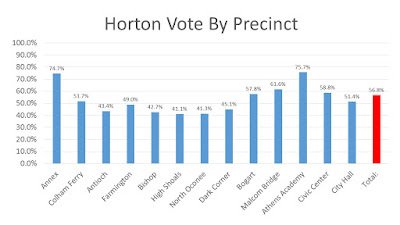 Horton did much better with the 1,620 persons who cast their ballots in the week of advance voting, getting 64.4 percent of those votes, compared with only 50.6 percent of the 2,037 votes cast at the polls today. Horton got 57.8 percent of those who voted by mail. The results are unofficial, and Board of Elections and Registration Chair Pat Hayes said approximately 60 ballots sent to military have not been counted. No provision ballots were cast today. Horton should be able to join the Board of Commissioners for its next meeting on Dec. 20. Horton left the Board in 2012 after losing his bid to unseat Melvin Davis in a race for Board of Commissioners Chairman. This was the first race for Wiedower, who is a custom home builder. Post 2 on the BOC has been vacant since March, when John Daniell left the Board to run unopposed to replace retiring Davis as BOC Chair. Daniell will take over as Chair in January. congratulations chuck horton! thank you, lee, for this news at the first possible moment. Thank you, Lee for outstanding reporting. Best to Mr. Horton and the incoming BOC board. Funny how Melvin only wanted Sunday alcohol sales after Frank Bishop and Costco demanded it. He never thought about it for local restaurants and supermarkets until Frank Bishop needed Costco to anchor his Epps Bridge expansion. Yes, thank you Lee and thank you Mr. Horton for running. It is amazing to me that only 15% of people voted after such a huge turnout in November. So many people emphasize the national elections which do affect us in the long run, but the local elections affect us every single day and are much more important to our daily lives. I just don't understand why 80% of the people that will be affected by the flyover and the sewerage issues did not bother to vote. Incredible! !